New Jersey Gov. 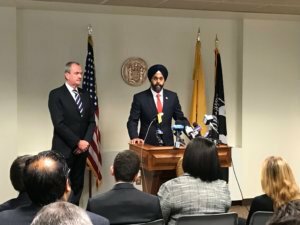 Phil Murphy on Thursday denounced an audio recording in which the sheriff of the state’s most populous county reportedly made racist remarks about blacks as well as the state’s Sikh attorney general, calling the remarks appalling. National Public Radio affiliate WNYC published comments from a secret taping it said it had obtained of Bergen County Sheriff Michael Saudino, who is white, making unsavory remarks after the January inauguration of Murphy, a Democrat who succeeded Republican Chris Christie. The station said that Saudino is heard talking to colleagues about Murphy’s speech. “He didn’t do that to help Bergen County, he did that because of the Turban,” he says. The Washington Post was not able to independently verify that Saudino was the one speaking on the audio files that WNYC published. His office did not respond to a request for comment. “If indeed that is Sheriff Saudino’s voice on the recording, he must resign,” he said. Saudino, who switched parties to become a Democrat in 2016 after running as a Republican previously, will be up for reelection next year, WNYC reported. Grewal told WNYC that he has worked with Saudino for two years and that he was surprised by the remarks. In the recording, Saudino also wonders about the sexuality of the state’s lieutenant governor, Sheila Oliver, who is unmarried. There are nearly 1 million residents in Bergen County, about 20 percent of whom are Latino, 17 percent Asian and 7 percent black, according to Census figures cited by WNYC. Before he was Sheriff of the county, Saudino was the police chief of Emerson, a predominantly white borough in the state, WNYC reported.